Wailea Ekahi Village This superb and luxurious ocean front property is surrounded by lush landscaping and sweeping ocean views. 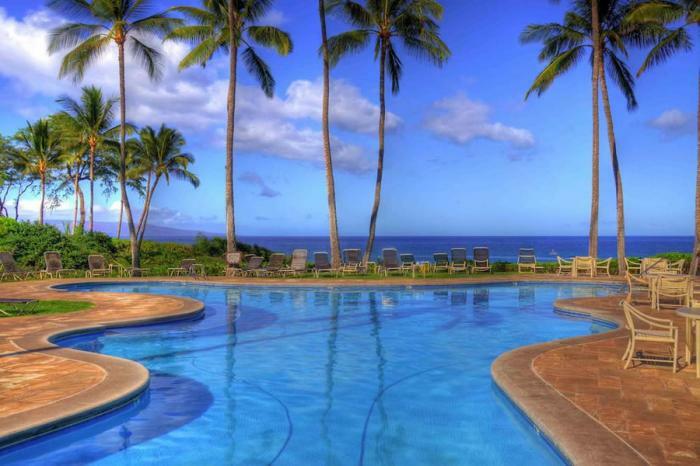 A relaxing and quiet community, Wailea Ekahi Village has 54 two-story buildings with condos beautifully decorated and furnished, offering miles of breathtaking sea views. Watch tropical sunsets from the pool, enjoy swaying palms after a leisurely dinner and take a romantic stroll on the beach. A great spot which to stargaze or watch the twinkling lights of Maui. Immaculately well maintained tropical grounds in a serene relaxation setting surrounded by inspiring vistas with an "Aloha' spirit. Enjoy fun filled days of sunshine and activities right from the spectacular and spacious beach. It's your Maui vacation home away from home.